By Aazan Ahmad, age 15, Seoul, South Korea. A Mandarin duck is known to be one of the most beautiful ducks in the world. It is one of the few living creatures who doesn’t cause any environmental problems. In China and Korea, they symbolize faithfulness because they are monogamous birds, meaning they mate for life. That is why every bride receives a pair on her wedding day. In this article, I will describe the Mandarin duck’s characteristics, appearance, habitat, ducklings, and diet. Mandarin ducks have many different characteristics. They are about 16-19 inches tall with a wingspan of 26-30 inches. They are able to fly and swim very well. Mandarin ducks are very social birds; they assemble in flocks, containing about 60 Mandarin ducks. The only time they are isolated from their flocks is during the breeding season. They are also migratory birds, meaning they migrate depending on what season it is. In summer, they can be found in Eastern Russia and Mongolia; however, they can be found in Easter China during the winter season. If they reside in Japan and Taiwan, then they don’t migrate. 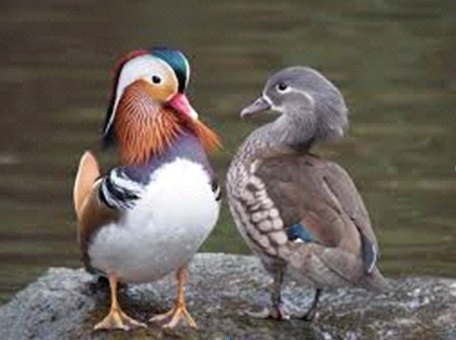 A drake, which is a male Mandarin duck, can easily be told apart from a female Mandarin duck just by looking at its appearance; this fact is known as sexual dimorphism. Like most male birds, a drake is much better looking than his female counterpart. A drake has a very colorful plumage while a female Mandarin duck has brown and black feathers. A drake has brown colored cheeks, a greenish black forehead, and a red-colored beak along with a white-colored tip; it also has long orange feathers on his face’s side, with orange colored “sails” at the back. Sprawling backward from his head is his white and brown-colored crown. He also has light orange-reddish flanks; his wings are dark brown with lustrous blue and green colored edges. While a drake’s purple chest has black and white stripes, his female counterpart only has white color markings around her eyes and around her throat area. The Mandarin ducks also have webbed feet, which allow them to swim. Mandarin ducks are found in Eastern Asia, China, Taiwan, Russia, and parts of Europe (including Great Britain and Ireland); very few of them are located in North America. Since the British people imported Mandarin ducks from China, there are about 7,000 of the Mandarin ducks found in England. The Mandarin ducks reside in coniferous and broadleaf forest areas, where ponds and streams are easily accessible. They tend to avoid lakes and other similar large open bodies of water. They can also be found in urban areas and on trees. Female Mandarin ducks usually make their nests inside a chamber of a tree when they are ready to lay eggs; they lay 9-12 eggs during April and May. Ducklings hatch after the incubation period (a time when females and sometimes males sit on their eggs to keep them warm and to make their eggs hatch), which lasts about 28-30 days; in this case, only the female Mandarin ducks sit on their eggs. When their mothers call them, the ducklings jump from their high trees, which is usually about 30-foot high; interestingly, the ducklings don’t get hurt from such a long fall. Mandarin ducks are omnivores, meaning they eat both plants and meat; they eat different things, depending on what season it is. During the summer time they feed on mollusks, small snakes, small fish, frogs, and dew worms. When it’s springtime, they eat aquatic plants, snails, insects, and fish. They eat acorns and a variety of seeds during the winter and autumn times. In conclusion, I have told five things about the Mandarin ducks: their characteristics, appearance, habitat, ducklings, and diet. 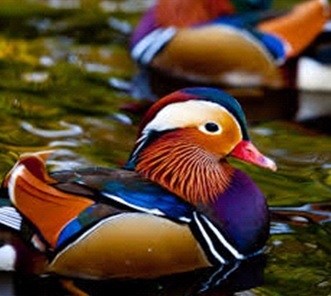 I hope you agree that Mandarin ducks are indeed the most beautiful ducks. Also, if you enjoy birdwatching, then I hope you will get to see one someday. Just remember one thing: if someone offers you a Mandarin duck dish, don’t eat it, because it’s great to look at, but not to eat!